A recent post here drew attention to a supposition circulated on Twitter by what are euphemistically termed 'social media influencers' blaming the financial demise of the café chain Patisserie Valerie on Brexit. The supposition was totally wrong: because the chain's downfall was the result of financial irregularities which were first identified and reported back in October 2018. This half-baked tweet about Patisserie Valerie is just one example of how fake news has been joined online by an even bigger problem, fake views. A recently published book forensically analyses one specific aspect of fake views. Feel-good quotes from the Buddha are a staple of Facebook, Twitter, Instagram and other social networks. There's only one problem: the Buddha didn't actually say most of them. Since 2003 the Buddhist authority Bodhipaksa has been investigating fake Buddhist quotes and identifying their origin. His investigations are chronicled on his website and in the book I Can't Believe It's Not Buddha! Bodhipaksa's analysis uses the fake quotes to explain the Buddha's authentic teachings in an easily accessible way. But the slim volume is of relevance far beyond Buddhism. It highlights the dangers of social media, where views carry so much weight whether they are fake or not - that Patisserie Valerie tweet which says explicitly that the chain "is now closing as a result of Brexit" has, to date, had 234 retweets and 334 likes. Approval in the form of likes, shares and retweets is the currency of social media. This approval is driven by common sense. Patisserie Valerie is failing financially. The belief of those who circulated the tweet is that Brexit will cause financial failures. Therefore their common sense told them that Patisserie Valerie had failed due to Brexit. But the problem is, as Bodhipaksa explains, that common sense is often wrong. One problem with accepting something only if it agrees with your common sense is that common sense is often wrong. It's common sense to many people that a ten-pound rock will fall faster than a one pound one. It's been common sense to many people over the millennia that the world is flat. And yet neither is the case. Some of the Buddha's teachings, like non-self, actually fly in the face of our common sense. Common sense tells us that we have a self-something that defines us and is the essential "us". But the Buddha taught that there was nothing we could identify as being, in any ultimate sense, a self. This is deeply counterintuitive. The problem is that if we accept only that which agrees with our common sense we end up accepting only that which we are already predisposed to believe. Perennial wisdom can teach us a lot, whether or not we have any empathy at all for the Buddha's teachings. Social networks with their filter bubbles and selective algorithms feed us with what we are already predisposed to believe. Because of this social media is the enemy of counterintuition, and counterintuition is a key ingredient of progress. Common sense triggers all those knee-jerk likes and retweets. But, unfortunately, as in the case of the Patisserie Valerie tweet, common sense is often wrong. 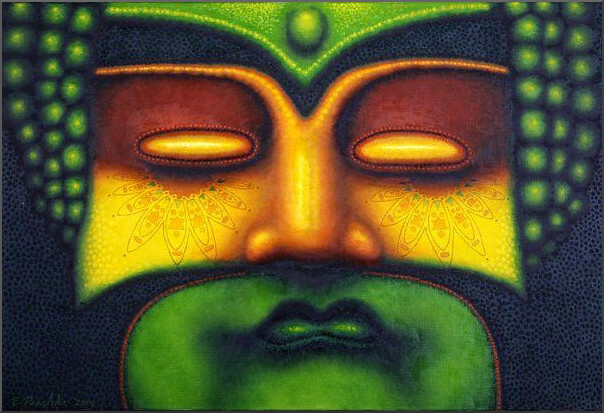 Header image is Ed Paschke's oil on linen painting 'Green Buddha'. New Overgrown Path posts are available via RSS/email by entering your email address in the right-hand sidebar. Any copyrighted material is included for critical analysis, and will be removed at the request of copyright owner(s).